Meet Emily and Paul, the parents of two young children. Emily is a newly promoted executive in a large corporation, while Paul has his own business as a consultant. Their lives, like all of ours, are filled with a bewildering blizzard of emails, phone calls, yet more emails, meetings, projects, proposals, and plans. For them, just staying ahead of the storm has become a seemingly insurmountable task. In this book, we travel inside the brains of Emily and Paul as they attempt to sort the vast quantities of information they're presented with and figure out how to prioritize, organize, and act on it. Fortunately for Emily and Paul—and for readers of Your Brain at Work —they're in good hands: David Rock knows how the brain works—and more specifically, how it works in a work setting. 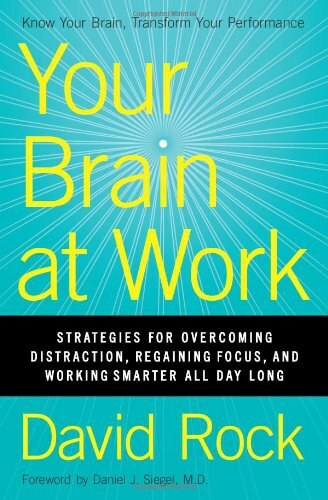 Your Brain at Work explores: Why your brains feels so taxed, and how to take full advantage of your mental resources Why it's so hard to focus, and how to better manage distractions How to maximize your chance of finding insights that can solve seemingly insurmountable problems How to keep your cool in any situation, so that you can make the best decisions possible How to collaborate with others more effectively Why providing feedback is so difficult, and how to make it easier How to effectively change other people's behavior Rock shows how it's possible not only to survive in today's overwhelming work environment but to succeed in it—and still feel energized at the end of the day, with a sense of accomplishment. All the chapters are worth reading. 1.The prefrontal cortex is a small stage requiring a lot of energy which is a limited resource - so prioritize prioritizing. Prioritizing (energy intensive) is hard because it involves imaging an moving around concepts of which you have no direct experience. Visuals (highly efficient and info rich) can help to maximize limited energy resource. Get things out of your head and onto paper so it reduces the load on your prefrontal cortex. Schedule the most attention-rich tasks for fresh and replenished times. Block schedule the day for different modes of thinking. Be disciplined about what not to put on the stage, when it is non-urgent or when info is not complete. 2. Space limits lead to competition. Working memory is always either visuospatial or auditory. Simplify complex ideas to their core elements (focus on the salient elements). When deciding, the optimal number of items to compare is 2. Practice getting your most important actors onstage 1st, not just the easiest ones. 3. Conscious process can be done only one at a time. Switching tasks leads to more mistakes. Embedding a repetitive tasks: you are pushing routines down into the basal ganglia (forming habits). Get decisions and thinking process into the right order to reduce "queues" of decisions. 4. VLPFC, the brake (the inhibitor, self control, focus, etc), is in a fragile, temperamental and energy hungry part of the brain. Your capacity to put on brakes decreases each time you do so. No free will, but there is "free won't", the ability to avoid urges. There is only a .2 second window to inhibit a response. Distraction is often the result of thinking about ourselves, which activates the default network in the brain. "brain signal, desire, movement": to inhibit impulses, you must veto them before they turn into action (early). And having explicit language for the mental processes helps with the vetoing. You need to be aware of your internal mental process and catch the wrong impulse before they take hold. Timing is crucial. Once an action is started, an energetic loop commences that makes it harder to stop the action. Many activities have built-in rewards, in the form of increase arousal that holds your attention. To avoid distractions, it's helpful to get into the habit of vetoing behaviors early, often, well before they take over. To reduce over arousal, activate other brain regions such as the auditory or the motor cortex. 6. Creativity: the projection of prior experience has to be actively suppressed and inhibited. The ability to stop oneself from thinking sth is central to creativity. Resolving an impasse requires letting the brain idle, reducing the activation of the wrong answers. Loose connection requires a quiet mind, w minimal electrical activities. Focus on the connections betw information rather than drilling down into the problem, simplify problems into their salient features, look at patterns and links from a high level rather than getting detailed. Peak mental performance requires knowing your brain and being able to observe your brain processes occurring. Such real time, goal-directed modulation of behavior is key to acting as a mature adult. You need this capacity to free yourself from the automati flow of experience, and to choose where to direct your attention. Without a director, you are a mere automaton, driven by greed, fear or habit. Mindfulness: the ability to pause before we react. It gives us the space of mind in which we can consider various options and then choose the most appropriate ones"
7. the away response is stronger, faster and longer lasting than the toward response. Labeling an emotion (symbolic, not a long dialogue) can reduce limbic system arousal. Practice noticing emotions as they arise, to become aware of them sooner. When you sense a strong emotion coming on, refocus your attention quickly on another stimulus, before the emotion takes over. Practice assigning words to emotional states to reduce arousal. 8. Perception of control over a stressor alters the stressor's impact. It is a major driver of behavior. "Our emotional responses ultimately flow out of our appraisals of the world, an if we can shift those appraisals, we shift our emotional responses." Reappraisal is one of the most important skills neeed for success in life, the other being the ability to observe your mental process. Mentoring, coaching: attempts to change your interpretation of events with a bonus prefrontal cortex. 9. Practice noticing what your expectations are in any given situation. Set expectation lower as exceeded expectations generate a strong increase in dopamine. Catch yourself when you go to give feedback, problem solve, or provide solutions. Help people think about their own thinking by focusing on their own subtle internal thoughts. feedback, reward them for activating their director. It is attention that changes the brain. "Self-directed neuroplasticity":rewiring your own brain by changing your attention. Don't try to influence people when they are in a strong away state. Each time you use your mental stage, allocate it to something important. It is a limited resource that can’t be wasted. Prioritizing is one of the brain’s most energy-hungry processes. The farther back a memory is, such as Emily’s tips from a training course on dealing with email, the longer this task will take, and the more attention and energy it will require. Picturing something you have not yet seen is going to take a lot of energy and effort. Prioritizing, at least in a knowledge economy full of conceptual projects, is definitely a black run. Do it when you are fresh and energized, or you might crash and burn down the hill. Creating visuals for complex ideas is one way to maximize limited energy resources. Another way involves reducing the load on the prefrontal cortex whenever possible. The idea is to get the concepts out of your mind and into the world, and to save the stage for the most important functions. This tendency means scheduling the most attention-rich tasks when you have a fresh and alert mind. One technique is to break work up into blocks of time based on type of brain use, rather than topic. Deep thinking tends to require more effort, so plan to do your deep thinking in one block, perhaps early in the morning or late at night. Not thinking when you don’t have to, becoming disciplined about not paying attention to non-urgent tasks unless, or until, it’s truly essential that you do. Don’t waste energy solving a problem you know you will have more information about later. Use the brain to interact with information rather than trying to store information, by creating visuals for complex ideas and by listing projects. The mental stage is smaller than you might expect. The stage works efficiently when you bring items onto it made up of elements embedded in long-term memory. While you can obviously remember more than one thing at a time, your memory degrades for each item when you hold a lot in mind. The fewer variables you have to hold in mind, the more effective you are at making decisions. The ideal number of new ideas to try to comprehend at once seems to be just one. Simple is good; simplest is best. The brain learns complex routines by automatically grouping information into chunks. The best chunks take fewer than two seconds to think about or repeat aloud. Becoming an expert in any field seems to involve creating large numbers of chunks, which enables you to make faster and better decisions than amateurs. Actors often get onto the stage because they are in the front row, not because they are the most useful actors for that moment. We all often think about what’s easy to think about, rather than what’s right to think about. While you can hold several chunks of information in mind at once, you can’t perform more than one conscious process at a time with these chunks without impacting performance. The key here is that you have to finish one operation before the next can begin. when people do two cognitive tasks at once, their cognitive capacity can drop from that of a Harvard MBA to that of an eight-year-old. If accuracy is important, don’t divide your attention. Constant emailing and text-messaging reduces mental capability by an average of ten points on an IQ test. For long-term memories to form, close attention has to be paid to information. You can learn to juggle lots of balls at work the same way a clown learns to juggle lots of balls: practicing specific activities over and over until they become embedded, which means the activities are not being managed by your prefrontal cortex. The basal ganglia are highly efficient at executing patterns. Use this resource every way you can. Taking time to work out the right order to make decisions can save a lot of effort and energy overall, reducing unresolved issues in your queue. Consciously decide how long you will split your attention, then go back to focusing on one thing. If you have to multitask, combine active thinking tasks only with automatic, embedded routines. One of the most effective distraction-management techniques is simple: switch off all communication devices during any thinking work. when you lose external focus, this default brain network activates and your attention goes to more internal signals, such as being more aware of something that may be bothering you. Inhibiting distractions is a core skill for staying focused. To avoid distractions, it’s helpful to get into the habit of vetoing behaviors early, quickly, and often, well before they take over. The harder part is learning to inhibit impulses as they arise. Speaking about ideas activates more circuits than merely thinking about those same ideas, which makes it easier to stay focused: the network is more robust. Your brain chemistry changes across the course of a day as a result of natural environmental stimulation. One strategy, perhaps the easiest and quickest, is to increase adrenaline levels by bringing “urgency” to a task. Fear brings a deep and immediate alertness. Visualizing an activity generates a similar metabolic response to actually doing it. Over-arousal may be more of a serious problem than under-arousal. Knowing a problem too well can be the reason you can’t find a solution. Sometimes we need a fresh perspective. “insight machines,” those whom Beeman can pick based on brain scans before an experiment, are those who have more awareness of their internal experience. They can observe their own thinking, and thus can change how they think. These people have better cognitive control and thus can access a quieter mind on demand. A good way to simplify a problem is to describe it in as few words as possible. Take the pressure off yourself, get an extension on your deadline, do something fun, reduce your anxiety any way you can. Take a break and do something light and interesting, to see if an answer emerges. Try quieting your mind and see what is there in the more subtle connections. Focus on the connections between information rather than drilling down into a problem; look at patterns and links from a high level rather than getting detailed. Simplify problems to their salient features; allow yourself to reflect from a high level, watch for the tickle of subtle connections preceding insight, and stop and focus on insights when they occur. Peak mental performance requires a combination of the two—knowing your brain, and being able to observe your brain processes occurring. “Mindfulness is a habit, it’s something the more one does, the more likely one is to be in that mode with less and less effort…it’s a skill that can be learned. Trying not to feel something doesn’t work, and in some cases even backfires. Describe an emotion in just a word or two, and it helps reduce the emotion. Open up a dialogue about an emotion, though, and you tend to increase it. People incorrectly predict that labeling an emotion will make them feel worse. Labeling an emotion can reduce limbic system arousal. Labeling needs to be symbolic, not a long dialogue about an emotion, for it to reduce arousal. The one thing that’s certain is that people will always pay lots of money at least to feel less uncertain. A sense of autonomy is a big driver of reward or threat. It’s the “perception” of choice that matters to the brain. Having an explanation for an experience reduces uncertainty and increases a perception of control. Research shows that people who see life through slightly rose-colored glasses do in fact seem to be the happiest. And happy people perform better at many types of work. just choose the perspective that makes you chuckle. The more social cues that are stripped out of communication, the greater the likelihood that intent will be misread. The one thing that makes people happy is the quality and quantity of their social connections. The brain thrives in an environment of quality social connections, of safe relatedness. Anytime you meet someone new, make an effort to connect on a human level as early as possible to reduce the threat response. Become friends with people you work with by sharing personal experiences. Fairness, it seems, can be more important than money. A sense of fairness can be a primary reward. Men don’t experience empathy with someone who is in pain who has been unfair, whereas women do. Find ways to sense increasing fairness around you, perhaps by volunteering or donating money or resources regularly. working with a perceived enemy is uncomfortable, and errors can be easily made due to a lack of sharing information and other by-products of a high threat level between people. Along with relatedness and fairness, status is another major driver of social behavior. Marketing departments use two main levers to engage human emotions through advertising: fear, and the promise of increased status. Being left out, being classed as “less than” others, is a universally painful experience. The more you can label status threats as they occur, in real time, the easier it will be to reappraise on the spot and respond more appropriately. Status is a significant determinant of human longevity, even controlling for education and income. Status is rewarding not just when you have achieved high status, but also anytime you feel as if your status has increased, even in a small way. An increase in status is one of the world’s greatest feelings. You can harness the power of the thrill of “beating the other guy” by making that other guy (or girl) you, without hurting anyone in the process. A study of social pain in 2008 found that social pain comes back when you think about it again, whereas physical pain doesn’t. Reduce status threats in others by lowering your status through sharing your own humanity or mistakes. Shifting other people’s attention from a threat state to focusing on what you want them to focus on is the central challenge to creating real change. Giving feedback is rarely the right way to create real change. Feedback creates a strong threat for people in most situations. The statement “let me tell you what others have been saying about you” is one of the fastest, easiest, and most consistent ways of making someone deeply anxious. Solving any problem creates a little rush of dopamine, which drags you farther into the story. Insights happen when people think globally and widely rather than focusing on the details. Help the other person notice the subtle, high-level connections in his own thinking, which will make insight more likely. Asking someone else for permission to stretch their thinking can create a nice positive flush from a sense of increased status and autonomy. Trying to change other people’s thinking appears to be one of the hardest tasks in the world. The positive reward from positive public recognition can resonate with people for years. Picturing something you have not yet seen is going to take a lot of energy and effort. This partly explains why people spend more time thinking problems (things they have seen) than solutions (things they have never seen). It explains why setting goals feels so hard to envision the future. Each time you changed your exercise mode, your muscles would get used in new ways, with some resting while other worked. It’s similar with mixing up types of thinking. Give your brain a rest when you can by mixing things up. your ability to make great decisions is a limited resource. Conserve this resource at every opportunity. * Prioritize prioritizing, as it’s an energy-intensive activity. * Use the brain to interact with information rather than trying to store information, by creating visuals for complex ideas and by listing projects. * Schedule blocks of time for different modes of thinking. How do you choose which are the best actors to have onstage at any moment? This decision itself takes a lot of energy and a lot of space. So it’s best done early. * Simplify information by approximating and focusing on an idea’s salient elements. * Practice getting your most important actors onstage first, not just the ones that are easiest. People notice you respond to issues quickly, so they send you more issues to respond to. Understand, decide, recall, memorize, and inhibit. The mind likes to wander, like a young puppy sniffing around here and there. In small doses, novelty is positive, but if the error-detection circuitry fires too often, it brings on a state of anxiety or fear. It seems that you may not have much free will, but you do have “free won't"
Too much arousal reduces performance above a certain level. Peak mental performance requires just the right level of stress, not minimal stress. Being creative involves getting around impasses. Inhibition: As long as your prior approach is most dominant, has the highest level of activation. you will get more refined variations of the same approach, but nothing genuinely new comes to the fore. The wrong answers are stopping the right ones from emerging. Take a break. Getting around an impasse is like trying to change the direction of traffic on a bridge: you have to stop the traffic from going one way before it can go the other. The limbic system tracks your emotional relationship to thoughts, objects, people, and events. It determines how you feel about the world, moment to moment. It drives your behavior, often quite unconsciously. we shouldn’t be too hard on humanity, though. Being able to stay cool under pressure is a basic requirement for many jobs today. To the brain, uncertainty feels like a threat to your life. The one thing that makes people happy is not money, not health. It's the quantity and quality of their social connection. The best place to store resources would have been by giving “favors” to others. The strong limbic arousal is good for physical activity but reduces creative thinking. Change is hard, and facilitating change in others is even harder. Attention went to your goal, rather than to your problem. The change occurs because attention is forced there. "Would you be willing to do this?" rather than " I want you to do this"
If the mental stage is a limited resource, it’s like other limited resources such as stocks, gold, or cash. Imagine if Emily treated her capacity to think in the same way her company managed its financial assets, with a tight control on spending. Picturing something you have not yet seen is going to take a lot of energy and effort. This partly explains why people spend more time thinking about problems(things they have seen) than solutions( things they have never seen). It explains why settings goals feels so hard (it’s hard to envision the future). Creating visuals for complex ideas is one way to maximize limited energy resources. Another technique is not to think at all about a project until all the information is at hand. Don’t waste energy solving problem you know you will have more information about later. The bottom line to all this is one simple message: your ability to make great decisions is a limited resource. Conserve the resource at every opportunity. Instead of choosing just the right actors to put onstage, what often occurs in a situation like this is that people’s stages become filled with the details of the new business. That’s because these details are fresh in mind, easy to get onto the stage. Whereas the issues listed here, while being important, are also a bit intangible; thus they take more effort to consider. We all often think about what’s easy to think about, rather than what’s right to think about. Embed repetitive tasks wher you can. Get decisions and thinking processes into the right order to reduce “queues” of decisions. Once you become aware of desire to move something—be it your finger in an experiment or yourself across the room to take your chances—your brain made this decision millions of connections ago. After this point, there are 0.2 seconds during which you are aware of being about to move, but haven’t yet taken the action. This 0.2-second window is a decent amount of time, long enough for the mind, with some practice, to notice an urge and perhaps intervene. However, without an awareness of the separation of these processes—“brain signal, desire, movement”—it’s likely you will go directly from brain signal to movement, the way most other animals do. You need to be able to discern these small time scales. To stop getting out of your chair once you start will take more veto power and more effort, than to decide not to get up when you first have the urge. To avoid distractions, it’s helpful to get into the habit of vetoing behaviors early, quickly, and often, well before they take over. If your alertness is too low, you can generate adrenaline by imaging something going wrong in the future, literally visualizing a scary event. At the dawn of Western philosophy, Socrates said, “The unexamined life is not worth living.” You can experience the world through your narrative circuitry, which will be useful for planning, goal-setting, and strategizing. You can also experience the world more directly, which enables more sensory information to be perceived. Experiencing the world through the direct-experience network allows you to get closer to the reality of any event. You perceive more information about events occurring around you, as well as more accurate information about these events. Noticing more real-time information makes you more flexible in how you respond to the world. You also become less imprisoned by the past, your habits, expectations, or assumptions, and more able to respond to events as they unfold. Mindfulness isn’t difficult. What’s difficult is to remember to be mindful. Having a director close to the stage helps keep your actors in line. As your director notices your brain’s quirks in real time, you get better at putting words to experiences, which makes you faster at identifying subtle patterns as they occur. This skill increases your ability to make subtle changes. As your mind makes changes in brain functioning in real time, you become more adaptive, responding in the most helpful way to every challenge that comes along. “Minimize danger, maximize reward” is the organizing principle of brain. Emotions such as curiosity, happiness, and contentment are toward responses. Anxiety, sadness, and fear, on the other hand, are away responses. As well as being a lot more anxious than happy, the limbic system fires up far more intensely when it perceives a danger compared to when it senses a reward. The arousal from a danger also comes on faster, lasts longer, and is harder to budge. Even the strongest toward emotion, lust, is unlikely to make you run, whereas fear can do so in an instant. (Just put a plastic spider on someone’s hand to observe this trait.) The toward emotions are more subtle, more easily displaced, and harder to build on, than the away emotions. This also explains why upward spirals, where positive emotions beget more positive emotions, are less common than downward spirals, where negative emotions beget more negative emotions. Human beings walk toward, but run away. He even found that when someone suppressed the expression of a negative emotion, the observer’s blood pressure went up. The observer is expecting to see an emotion but gets nothing. This is odd, and in this way, suppression literally makes other people uncomfortable. “A bit like secondhand smoke, suppression has a real impact on others,” Gross explains. Here’s the bottom line: describe an emotion in just a word or two, and it helps reduce the emotion. Open up a dialogue about an emotion, though, and you tend to increase it. He notices himself feeling defensive, but settles his emotions again by quietly recognizing the defensiveness. Labeling an emotion can reduce limbic system arousal. Labeling needs to be symbolic, not a long dialogue about an emotion, for it to reduce arousal. The brain likes to know what is going on by recognizing patterns in the world. It likes to feel certain. The one thing that’s certain is that people will always pay lots of money at least to feel less uncertain. That’s because uncertainty feels, to the brain, like a threat to your life. Choosing in some way to experience stress is less stressful than experiencing stress without a sense of choice or control. If Emily had known that it was “normal” to feel overwhelmed in the first few weeks of a new job, her sense of uncertainty would have decreased. Having an explanation for an experience reduces uncertainty and increases a perception of control. The field of change management builds on the power of normalizing, by describing the emotions and stages that occur during change, such as denial or anger, to help people reduce the threat response. When you normalize a situation, be it the stress of a new job or the challenges of bringing up teenagers, you are using a second type of reappraisal. Each of these four types of reappraisal—reinterpreting, normalizing, reordering, and repositioning—are techniques people use all the time. With a deeper understanding of the biology behind reappraisal, and thus richer, easier-to-rind maps for these techniques, you can begin to reappraise more often, and more quickly, which can significantly increase your ability to stay cool under pressure. The best way to manage your expectations (without any side effects) is to start to pay attention to them, which means activating your director. Unmet expectations are one of the important experiences to avoid, as these generate the stronger threat response. “With any brain function, the important thing is firstly to minimize threat,” explains Evian Gordon. “Only once threat has been minimized can you focus on increasing possible rewards.” Speaking aloud about complex ideas can be a way of seeing your own thinking more clearly. As we wrap up the second act, you now have three specific techniques for staying cool under pressure. Each of them requires activating your director and getting focused on the present, which will increase the space on your stage. For average emotional hits you can try labeling your emotions, which increases a sense of certainty and reduces limbic arousal. For stronger emotional hits you can reappraise, by changing your interpretation of events. This can increase both certainty and autonomy, while having a stronger dampening effect. And to help reduce future bursts of arousal, you can manage your expectations by being aware of what they are, and choosing new expectations in their place. What happens is that when we witness others’ facial expressions, we activate the same in our own motor cortex, but we also transmit the information to the insula, involved in our emotions. When I see your facial expression, I get the movement of your face, which drives the same motor response on my face, so a smile gets a smile. The motor resonance is also sent on to your own emotional centers, so you share the emotion of the person in front of you. Here’s one big reason collaboration is difficult: just as the brain automatically classifies any situation into a possible reward or threat, it does the same with people, determining, subconsciously, whether each person you meet is either a friend or foe. Is he someone you want to spend more time with (walk toward if we see him coming). And here’s the rub: people you don’t know tend to be classified as foe until proven otherwise. I found that the greater levels of social support people said they had, the less sensitive they were to things like rejection. When you think someone is a foe, you don’t just miss out on feeling his emotions; you also inhibit yourself from considering his ideas, even if they are right. People are classed as friend or foe quickly, with foe as the default in the absence of positive cues. Anytime you meet someone new, make an effort to connect on a human level as early as possible to reduce the threat response. Paul doesn’t know that fairness is a primary need for the brain. A sense of fairness in and of itself can create a strong reward response, and a sense of unfairness can generate a threat response that lasts for days. As one example, because of the generalizing effect, accidental connections become easier: if you think one person is being unfair, everyone else may seem to be acting unfairly, too. In this scene, Ned’s fairness issue came from thinking Paul wasn’t taking into account their long history of helping each other. In an overly aroused state, Paul responded with his own sense of unfairness, mistakenly thinking that Ned was asking him to lose money on the project. Many arguments between people, especially those close to us, involve incorrect perceptions of unfairness, triggering events that activate an even deeper sense of unfairness in all parties. This often starts by someone misreading one person’s intent, being slightly mind-blind for a moment. The result can be an intense downward spiral, driven by accidental connections and one’s expectations then altering perceptions. Organizations that allow people to take time on community projects are letting their employees be rewarded by a perception of increasing fairness. Many employees find this a deeply satisfying part of their job. If you expect someone to be fair with you and they are, you get a nice positive dopamine high, for two reasons: first, from your expectations being met, and second, from the fairness itself. Unexpected fairness should be even more pleasant, which explains why the “kindness of strangers” can feel so meaningful. “I’m sorry about the emails,” Paul jumps in. “You deserve more than that after all these years. I know you must think this situation is unfair, and I want you to have a chance to say what you think. Then maybe we can brainstorm a bit about how we can help each other more, if not on this project, then on others.” Paul knows Ned is feeling unfairness. Linking fairness and expectations helps explain the delight of the kindness of strangers, as well as the intense emotions of betryal from people close to you. Men don’t experience empathy with someone who is in pain who has been unfair, whereas women do. Find ways to sense increasing fairness around you, perhaps by volunteering or donating money or resources regularly. Status is relative, and a sense of reward from an increase in status can come anytime you feel "better than” another person. Because of the intensity of the status—drop experience, many people go to great lengths to avoid situations that could put their status at risk. This aversion includes staying away from any activity they are not confident in, which, because of the brain’s relationship to novelty, can mean avoiding anything new. While he didn’t run away physically, he did run away mentally: he ran away from thinking. Being “right” is often more important to people than, well, just about anything else, at the cost of not just money but relationships, health, and sometimes even life itself. Many of the arguments and conflicts at work, and in life, have status issues at their core. The more you can label status threats as they occur, in real time, the easier it will be to reappraise on the spot and respond more appropriately. Maintaining high status is something that the brain seems to work on all the time subconsciously. You can elevate your status by finding a way to feel smarter, funnier, healthier, richer, more righteous, more organized, fitter, or stronger, or by beating other people at just about anything at all. The key is to find a “niche” where you feel you are “above” others. If you want to have a potentially threatening conversation with someone, try talking down your own performance to help put the other person at ease. Another strategy for managing status is to help someone else feel that her status has gone up. Giving people positive feedback, pointing out what they do well, gives others a sense of increasing status, especially when done publicly. To play against yourself gives you the chance to feel ever-increasing status, without threatening others. And if you share your progress (and challenges) with others, it can incease a sense of relatedness, too. I have a hunch that many successful people have worked all this out and play against themselves a lot. To play against yourself you have to know yourself. And this requires a strong director, but it also builds a stronger director as you focus on how you are growing. And here’s a really big idea: one way you might play against yourself could be to work on improving your capacity to catch your brain in action. You could practice getting faster at things such as labeling and reappraising, reading other people’s states, or developing a quiet mind when needed. As you improve your skills in this area you raise your status, without risking other people’s status. You increase relatedness if you share with you notice; you even build your director. And of course you make better decisions, deal better under pressure, and collaborate better with others. SCARF model, which stands for Status, Certainty, Autonomy, Relatedness, and Fairness. A study of social pain in 2008 found that social pain comes back when you think about it again, whereas physical pain doesn’t. Think about what it feels like when you interact with someone who make syou notice what’s good about yourself (raising your status), who is clear with his expectations of you (increasing certainty), who lets you make decisions (increasing autonomy), who connects with you on a human level (increasing relatedness), and who treats you fairly. You feel calmer, happier, more confident, more connected, and smarter. You are able to process richer streams of information about the world, which feels like the world has gotten bigger. Because this experience feels so good, you want to spend time with this person and help them any way you can. He hadn’t put words to what he was feeling, but hearing this statement from Emily relieves his anxiety. He now knows why the call was so enraging to him. It would be unfair for Colin to be harsh to Emily now. She has allowed herself to be wrong, which has raised his status by dropping hers. When everyone is trying to be higher status than others there is a decrease in relatedness. After giving up on providing feedback, Paul is taking a logical approach to helping someone else solve a problem. He tries to understand the source of Eric’s problem, and then makes suggestions. I call this approach the default approach to helping people. What Paul doesn’t realize is that this default approach is inefficient for solving human problems, and even has some undesirable side effects. Giving others feedback is often the first strategy people use to facilitate change. Yet, surprisingly, giving feedback is rarely the right way to create real change. While there are many “techniques” to improve the performance of feedback, people miss the basic reality of this approach: feedback creates a strong threat for people in most situations. The statement “let me tell you what others have been saying about you” is one of the fastest, easiest, and most consistent ways of making someone deeply anxious. The key is to make sure you solve the right problem, which means the most useful problem, not just the most interesting one. If having a problem focus is so unproductive, why do people do it so often? One answer is that the problem-focused approach looks “safer”. Remember that the brain dislikes uncertainty. The past has lots of certainty; the future, little. Going into the past might make you want to take a nap, but finding answers amid uncertainty can feel like diving into a deep and unknown ocean. The difference between the two taxi scenarios is based on one key decision: to focus on the desired outcome (getting a taxi) rather than on the past. Attention went to your goal, rather than to your problem. The decision to focus on an outcome instead of a problem impacts brain functioning in several ways. First, when you focus on an outcome, you prime the brain to perceive information relevant to that outcome (find a taxi), rather than to notice information about the problem (not getting to the airport). You can’t be looking for solutions and problems at the same time. That would be like trying to hold two large numbers in mind at once, and trying both to add them up and to multiply them at the same moment. Given that Eric is at an impasse, Paul needs to help him find an insight to solve this problem. If Paul can’t make direct suggestions, why can’t he just give Eric some clues about what to think about, perhaps posing a good suggestion as a question? One of the most common strategies human beings use to help one another solve problems involves these techniques: giving advice about what to do or what not to do. Ohlsson shows that this is only marginally effective. The other strategy people use is to dive into the problem. These two approaches make up the majority of the human default approach to helping others get unstuck. Clearly the intuitive human response to helping others is far from efficient and needs rethinking. As people are often already anxious when stuck at an impasse, and anxiety generally make people’s views narrow and their brains noisier, it’s important to reduce people’s anxiety and increase their positive emotions — in other words, to shift them from an away state to a toward state. A great way to do this is using elements of the SCARF model. You could help the person increase her sense of status, perhaps by encouraging her. Or increase someone’s sense of certainty by making implicit issues more explicit, say, by clarifying your objectives. Or increase a person’s sense of autonomy by ensuring that he is making the decisions and coming up with the ideas, not just listening to your suggestions. Sometimes reducing a problem to one short sentence can be enough to bring about insight on its own. Help the other person notice the subtle, high-level connections in his own thinking, which will make insight more likely. While you can’t control insight, you can influence it more than people realize. What you are doing is facilitating in others the ARIA model (Awareness, Reflection, Insight, and Action). One big advantage of this technique is that it raises people’s status by implicitly saying, “You have good ideas. Let’s explore what your good ideas are, rather than think about mine.” When you ask people to pay attention to their own subtle internal ideas, you are also activating their director. This will also help dampen their overall arousal. Lieberman plays with this traditional incentive structure. He grades his students’ work based on how well they incorporate their own earlier criticisms into their writing, on how much they can change. Their status is linked to the criticizing side, instead of to being criticized. It’s like being a masochist — you feel good about beating yourself up. “So, why did it go wrong, what was the problem?” Paul asks. Just as he says this, he remembers noticing a pattern in similar situations: focusing on a solution often brings better results than focusing on a problem. He turns the question around. “You know what. Don’t worry about what the problem is. It’s not that useful. I’m sure you did your best. Let’s think about what we can both do here to rescue the situation. I’m not going to give you a hard time. Let’s work together on this, okay?" “Can I ask you a few questions, to see if I can help you solve this?” Paul says. “Sure,” Eric responds. Asking someone else for permission to stretch their thinking can create a nice positive flush from a sense of increased status and autonomy. While the easy answer may seem to be to give people feedback, real change happens when people see things they have not seen before. The best way to help someone see something new is to help quiet her mind so that she can have a moment of insight. Giving feedback often creates an intense threat response that doesn’t help people improve performance. Bringing people to their own insights is a fast way of getting people back on track. Help people think about their own thinking by focusing them on their own subtle internal thoughts, without getting into too much detail. Find ways to make it valuable for people to give themselves feedback; reward them for activating their director. The change occurs because attention is forced there. It seems that attention can quickly change the brain, if enough attention is paid to stimuli. It’s just that attention doesn’t tend to go easily to one place and stay there. When you change your attention you are, according to Schwartz, facilitating “self-directed neuroplasticity.” You are rewiring your own brain. The director isn’t just good for your health and important for being effective at work, it’s a key ingredient in how you sculpt your brain in the long term. As Sir Winston Churchill once said, “I love to learn, but I hate to be taught.” If being changed by others is usually a threat, this leads to the idea that when realy change occurs, it is probably because an individual has chosen to change his own brain. Self-directed neuroplasticity, the director monitoring and altering the show, may be the true heart of change. However, external rewards such as holidays or money have limited use. You can’t just keep offering these to motivate people, because if people expect this reward it tends to become less valuable, and a reward isn’t so rewarding unless it gets bigger each time, which isn’t sustainable. “There are toward goals and away goals,” Barrell explains, “and which one you use has quite an impact on performance. Toward goals have you visualize and create connections around where you are going. You are creating new connections. What’s interesting is you start to feel good at lower levels with toward goals. There are benefits earlier. Away goals have you visualize what can go wrong, which reactivates the emotions involved.” The trouble is, because problems come to mind so much easier than solutions, people are always setting away goals instead of toward goals. Also, problems are more certain than unknown solutions, and the brain naturally steers toward certainty. Focused attention changes the brain. Don’t try to influence people when they are in a strong away state. In other words, you discovered that being able to notice your own thinking process itself was central to knowing and changing your brain. Surprises About the Brain Conscious thinking involves deeply complex biological interactions in the brain among billions of neurons. Every time the brain works on an idea consciously, it uses up a measurable and limited resource. Some mental processes take up a lot more energy than others. The most important mental processes, such as prioritizing, often take the most effort. Some Things to Try Think of conscious thinking as a precious resource to conserve. Prioritize prioritizing, as it’s an energy-intensive activity. Save mental energy for prioritizing by avoiding other high-energy-consuming conscious activities such as dealing with emails. Schedule the most attention-rich tasks when you have a fresh and alert mind. Use the brain to interact with information rather than trying to store information, by creating visuals for complex ideas and by listing projects. Schedule blocks of time for different modes of thinking. When you try to hold thoughts is your PFC (PreFrontal Cortex) . Brain Functions; Understand, Decide, Recall, Memorize and Inhibit uses the PFC which has a very limited resources. Doing a non-trivial math problem requires the brain to start thinking of one thing only : It must think serially and it can't think parallel. Very conscious thinking uses a very small part of the brain, uses energy,you can only do one thing at a time. People looking to put less effort into things and avoid effort/discomfort. PFC Size Analogy:If the amount of memory that can be held at one time in the PFC(aka working memory) is the size of a cubic foot the size of the rest of the brain is the Milky Way. "A Threat Response" feeling anxious. It's hard to make others do things that require an effort to think/change they will react with a threat response. We gravitate toward things we do well and try to make our actions thought free. Rational Thinking is overrated in two ways 1)what you can do with it and 2) It's not how we solve most problems. Any time you do a math problem or make a conscious decision you use up a limited bucket of resources. Doing a math problem uses a limited resource, uses up glucose,Effort uses Energy. Your brain becomes noisy. If you truly respected attention as a limited resource what would you do differently ? About 60% of problems we solve we don't know how we solved it. The PFC is an inhibitor. In order for insights to occur you have to stop thinking. You have to dampen down the existing status quo thought. Allow for an entirely different wave of thinking. The ability to quiet things down allow for more insights. The ability to listen to loose associations. (brain storming). The more happy the more weak associations you notice. Big Question: What does it express about what you presently do and what does it express about what maybe you might do differently ? Internal Data Processing Cognitive Control start thinking one way then switch to another is a valuable skill to have. In problem solving the brain goes into idle for a few seconds and significantly fewer brain cells are used meaning less electrical activity, less arousal, less dopamine. It is quieter and needs to be listened to. You need to notice spikes of Dopamine to notice these thoughts. The ability to have these insights is equivalent to your ability to quiet down you mental activity during this time. When happy more notice of weak associations. Your field of view expands with Happiness. What does this explain of what you currently do? and what does it suggest of what you should do differently ? PFC is the only part of Brain connected to all others. The only part which has a braking system . It is where imagination takes place.Think it as a stage where you can launch thoughts and compare them to others. Combine information and make it into something new. Braking helps with the capacity to regulate emotions. 18:00-Starts talking about Emotions being backward. We as a general society have emotions backward. The Limbic system is always on the look out for negative things. Weighs things as a reward or threat and is strongly moving way from threats and moves slower toward rewards. The only organizing principle is to Minimize threats and Maximize rewards. Threats even minor creates reduced insights or Noise. Cognitive is the best but it must be done quickly. You must be aware of emotional states. * Reappraisal (re-framing)- Use the time to do something really great. The more you understand about your brain the more you can reappraise all sorts of internal threats. You can actually reappraise things as brain functioning, not you, something that can be changed. Change to a shift state where you see more options. The degree of activation of the Limpic system is in direct response to the degree of activation of the PFC. *Those who suppress more vs appraising more have diminished lives in many areas. Maslow Hierarchy of needs is WRONG. Social needs are primary . We tend to Emotion Regulation Research. The moment we get a threat we change immediately. A strong positive impacts our abilities as well. Cognitive Change needs to happen quickly,It's preferred but must happen quickly. It requires being aware of cognitive states. When Labeling do it with a word or two don't relive the state which can worsen it. Label is hungry, angry. Saying it outload reduces the cognitive load. Using a negative event traffic to good use :ie practice, listen to book on tape. Do you suppress or reappraise. The more you understand about the brain,the more you can reapraise. Shift from a threat state to a state you are more comfortable. It's Maladaptive in the work place. Praise is the more important than money. Even a computer voice saying Good Job is a great reward. Foe is default with exceptions of really attractive people, baby, when you're drunk. Engagement is an increase in dopamine and we are being rewarded. Deep Engagement doing thing that make a difference in the world. Attention changes the brain in seconds. It's easier to change attention when you feel safe. Q: Why are you always happy? Direct Experience Circuitry: Literal interpretation . Directly taking in Data. In the Flow. Narrative Response Circuitry: A story of the event. taking in data @ real time and how much more energetic you feel and how your world has expanded. Focus on being Unfocused and listening to what comes into your mind. Brain can only focus on one thing that is the brain's limitation. Dual task will cause a big drop-off in accuracy or performance. Our basal ganglia can help you do more automatic tasks. Some decisions are based on others, it will form a queue. So we'd better to get the information onstage in the best possible order. We should schedule work according to the type of mental task needed, that allow ous focus on one thing. We can focus on only one conscious task at a time and should take the limitation respectfully! We should do one task at a time and get things done in right order. Basal ganglia can capture routes which allow us do more tasks.